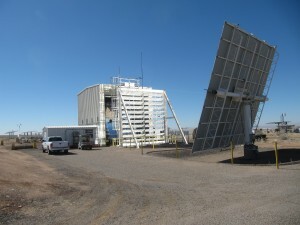 Operated by Sandia National Laboratories for the U.S. Department of Energy (DOE), the National Solar Thermal Test Facility (NSTTF) is the only test facility of this type in the United States. The NSTTF’s primary goal is to provide experimental engineering data for the design, construction, and operation of unique components and systems in proposed solar thermal electrical plants planned for large-scale power generation. a rotating platform for parabolic trough evaluation. The NSTTF welcomes all users. 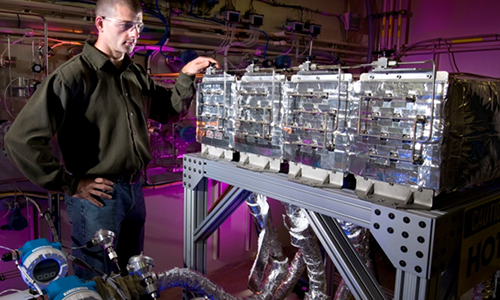 Several mechanisms are available for non-Sandia researchers to contract with Sandia to use the facility. 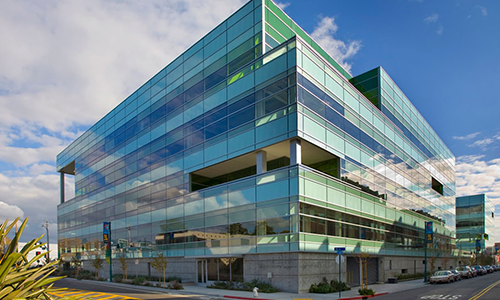 Previous users include government contractors and agencies, research institutes, universities, and private companies. For more information, or to discuss specific testing and other ways to contract with Sandia, please contact Dr. Paul Gauche, (505)844-0964. All NSTTF official business tours must be arranged in advance due to base security requirements (Sandia National Laboratories is located entirely within Kirtland Air Force Base boundaries). 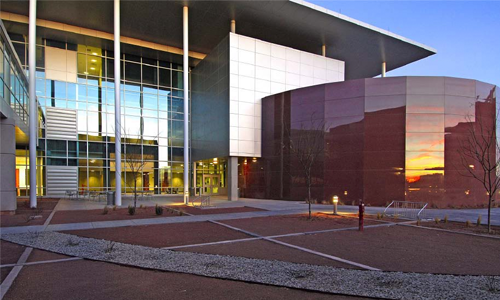 Contact 505-844-1445 to arrange for an official business tour (maps to NSTTF will be provided). 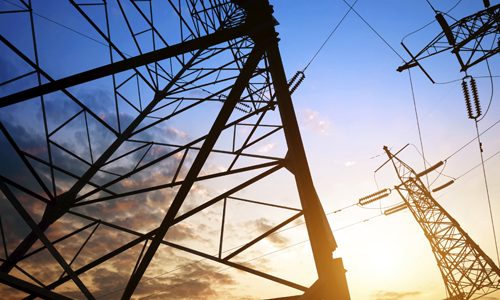 Exemption(s): DOE CSP/SunShot-funded projects are exempt from test fees due to annual O&M support of the NSTTF. 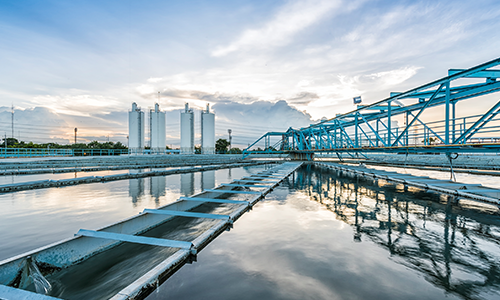 A 10% fee is charged against funding to all new projects or amendments to existing projects utilizing any of the designated facilities or capabilities above, regardless of funding source. This calculation does not levy 10% on any amounts paid in test fees. User Facility customers subject to the User Facility Access & O&M Fee (below). 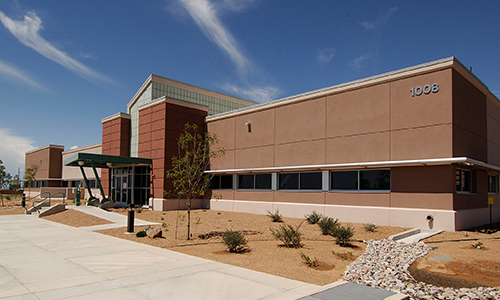 A required monthly fee of $2,700 is charged to User Facility customers who have entered into a Technology Deployment Center Use Agreement with Sandia. This monthly fee is designed to recoup O&M costs for User Facility customers only, is in lieu of the 10% O&M fee, and allows site access and use of site equipment. This does not grant exemption to test fees. Customer will be required to take Sandia training prior to use of equipment. The heliostat field has 218 individual heliostats. This capability directly supports the SunShot goals by providing flux levels of greater than 300 W/cm2 and total power in excess of 6 MWt. Each heliostat has two motors and two drives (one azimuth and one elevation), one 480 V power box, one electronics box, and one control box and associated cabling. The total reflective area on each heliostat is 37 m2. The reflectivity on the recently replaced facets is 96%. 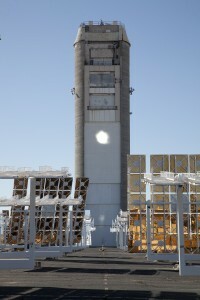 The tower is a 61 m (200 ft) high concrete structure with three test locations on the north side and the top of the tower. 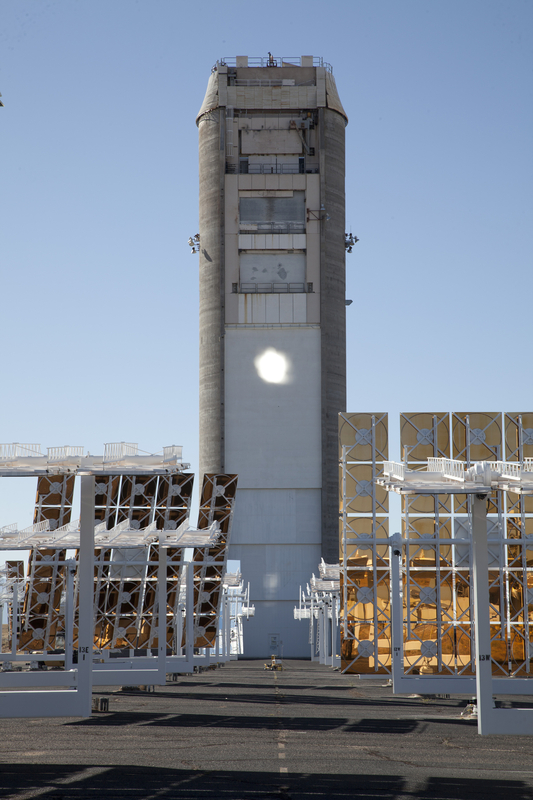 The tower can support testing for CSP experiments and large-scale, high-flux materials samples. The equipment in the tower includes a 100-ton capacity elevating module for lifting experiments to the top of the tower, internal cranes for receiver fabrication, water glycol cooling systems and air coolers to provide heat removal from experiments, air compressors, control valves, generators, uninterruptible power supplies, piping systems, and pressure-relief valves. 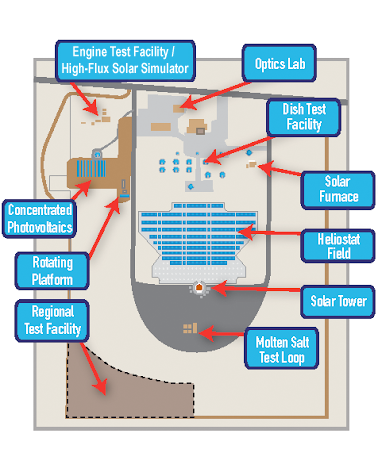 The molten salt test loop directly supports the SunShot goals by providing development for thermal energy storage costs ≤$15/kWhth and by allowing greater collection efficiencies and higher-temperature operation for linear Fresnel and trough systems through utilization of molten salt HTF. The facility also provides a means of performing accelerated lifetime testing on components, thus reducing the risk of the technology. 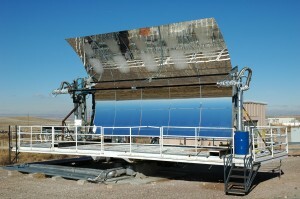 Though operating below 600° C, many of the lessons learned at this facility will be directly applicable to molten salt systems operating in the SunShot temperature range ≥ 650° C.
The AZTRAK (AZimuthal TRAcKing) Rotating Platform system was originally designed and installed at Sandia during the early 1980s to enable more accurate and rapid thermal performance testing of parabolic concentrators. When a parabolic concentrator (or any other solar collecting device) is equipped with an elevation tracker and mounted on the rotating platform, the solar position of the collector can be continuously maintained at any desired orientation. The High Temperature Fluid Loop was designed in conjunction with the AZTRAK system to supply heated fluid to the collector inlet, at steady-state fluid temperatures up to 375°C, to evaluate the thermal performance of a parabolic concentrator at system operating temperatures. Ability to track sun in azimuth at 0 degrees incidence angle (eliminate off-axis cosine affects), but can track at any desired incident angle. Azimuth tracking: Resolution of 0.09 deg., accuracy of 0.30 deg. Elevation tracking: Resolution of 0.04 deg. ; accuracy of 0.08 deg. To cover the temperature range of near ambient temperatures up to 375 used for trough testing two different fluids are used. 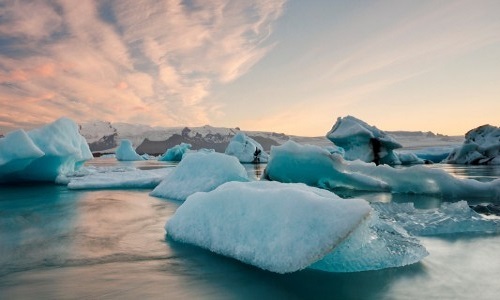 Water is used for testing where the fluid temperatures are near ambient. The high temperature fluid loop contains oil, Syltherm 800, and is used from 70°C up to 375°C. SNL’s Photovoltaic and Distributed Systems Integration department and staff from the NSTTF worked with SunPower to install 110 kWe of SunPower’s new C7 low-concentration PV systems at the NSTTF. 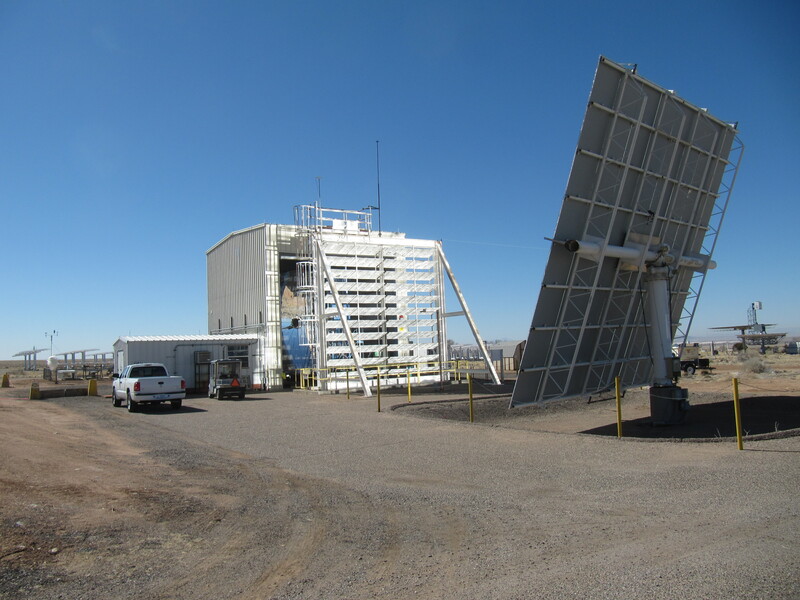 This is the first demonstration of a utility-size CPV test at SNL. 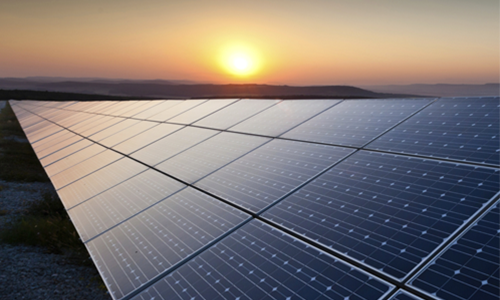 The PV Reliability group worked closely with SunPower during the development and early implementation stage to support design optimization. 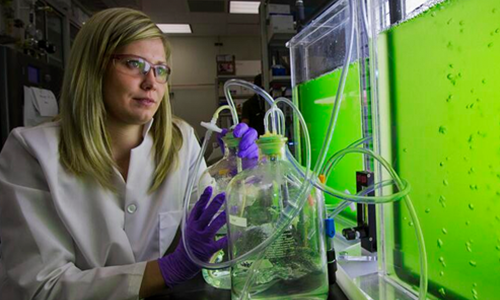 SNL is using the systems data to evaluate the reliability of this low-concentration system. SunPower is using the site to test new components in side-by-side comparisons. The groups are working together to improve performance models specific to this technology. Concentrating photovoltaic array located at the NSTTF, hardware provided and operated by SunPower Corporation. This testing area is primarily configured to establish the overall performance of a heat-powered engine, including its efficiency, power output, and reliability. To date, research has been conducted both on externally heated Stirling, organic Rankine, and steam Rankine engines and on the devices that generate the thermal input to these engines. 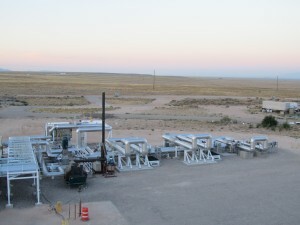 The capabilities of Test Cell 1 include a fuel/air combustion skid for energy input; cooling systems for heat removal; 130 kW eddy-current dynamometer for precision power measurements; and instrumentation, system protection, and power control channels.For measuring the thermal output of fuel-fired thermal energy systems, such as a gas-fired liquid-metal evaporator for Stirling engines, Test Cell 1 offers a gas-gap calorimeter, which simulates the engine by allowing the liquid metal to condense at operating temperatures. 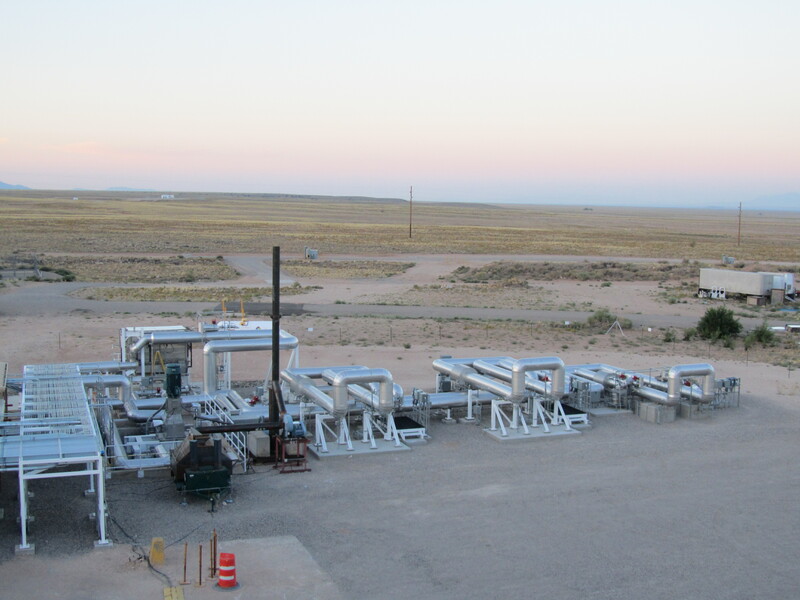 Test Cell 2 is currently set up to test bench-scale solar receivers, which are devices that absorb the concentrated solar energy from the sun and transfer it to a heat engine. In the testing area, the solar input is simulated by quartz lamp banks and their associated power control systems. Power is absorbed using gas-gap calorimeters. 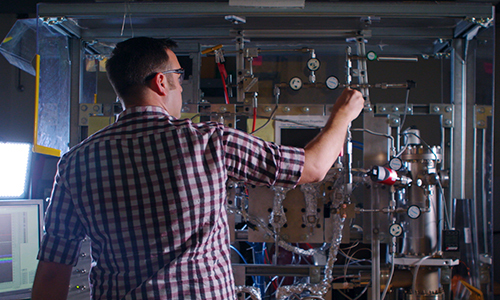 This test cell also supports bakeout and fills operations on liquid-metal heat-transfer devices. For these operations, portable heat trace and heat-trace control systems are available, as are portable vacuum systems and residual gas analyzers. 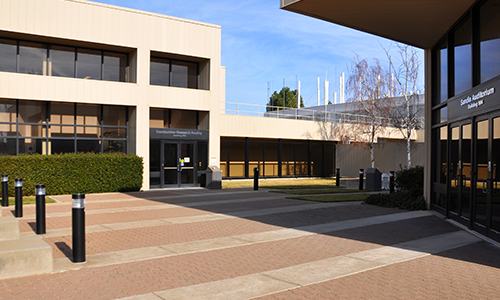 The Engine Test Facility offers a well-equipped control room for personnel to monitor tests. The data acquisition system (DAS) measures, displays, and stores the data from each data channel in the system. The HP3852 DAS is controlled by a personal computer with LabView software. Additional personal computers are also available for data reduction and other applications. Color video cameras are provided to capture the tests on film. The video lines are routed into the control room, are displayed on high-resolution monitors, and can be stored on 8-mm tape. Optical equipment located in this lab space and tools developed, using DOE funds, allows for optical characterization of heliostat and dish facets. 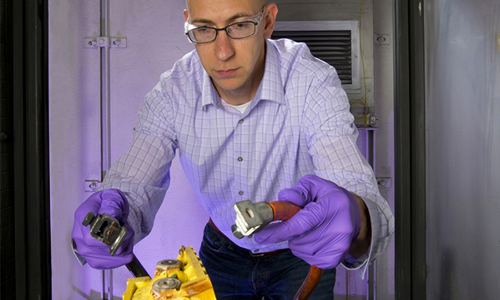 These flexible analytical tools, along with the on-site expertise currently support the evaluation and development of low-cost, high-performance heliostat facets. The tools are also applicable to assembly/production line environments. 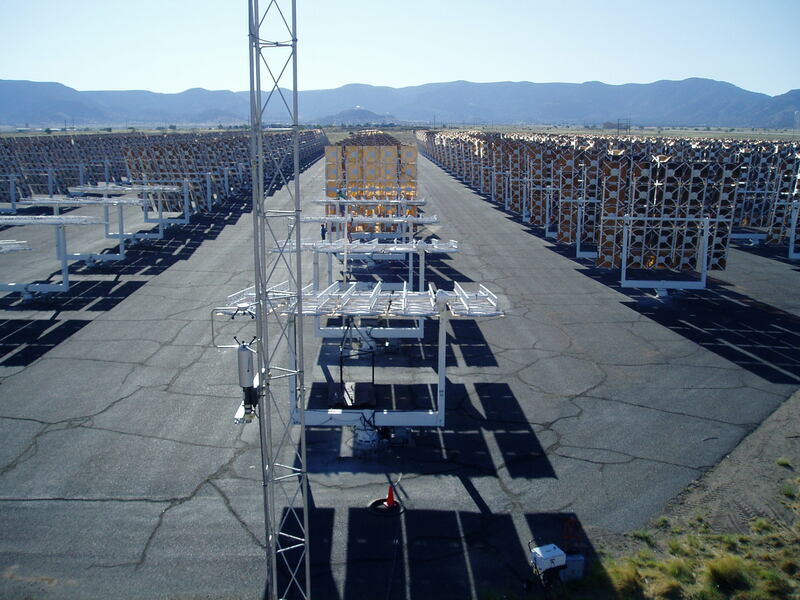 In addition, field support for characterization and alignment of CSP systems is provided. 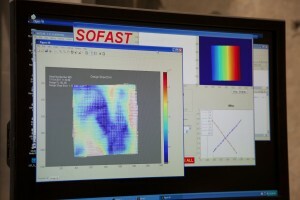 SOFAST, a highly accurate fringe-reflection-based measurement tool, is used to characterize and set the focus heliostat facets in the laboratory. H-FACET is an optical-based alignment tool that is used to efficiently re-align the facets after re-attaching them to the heliostat. AIMFAST is used to characterize dish facets and align dish systems. This area of the site allows industry partners to install full-scale solar dishes for long-term reliability testing and evaluation. There are currently ten Stirling Energy Systems (SES) dishes and six Infinia dishes at this location. 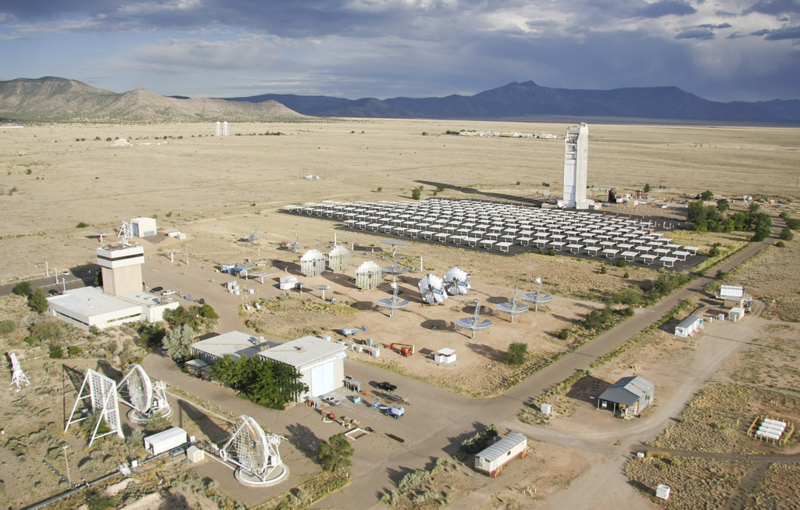 The site also includes two SNL-developed solar dishes that are available for research. Solar dishes can be used for the high-temperature portions of the SunShot goals. A solar furnace uses a heliostat that tracks the sun to direct sunlight onto a mirrored parabolic dish. Because the focal point of the dish does not move, it is simple to install experiments. The power level of the furnace is adjusted using an attenuator that works like a venetian blind located between the heliostat and the dish. The furnace has a power control to simulate nuclear and other thermal transients. 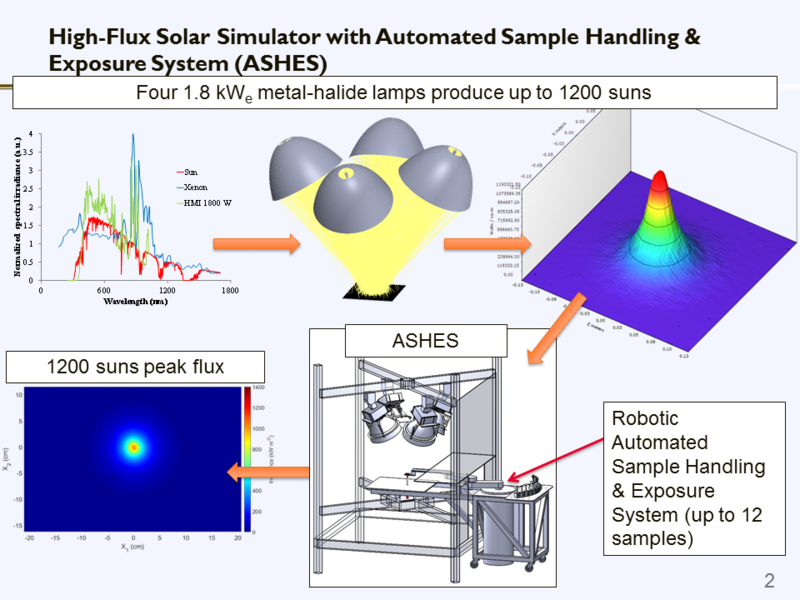 The High-Flux Solar Simulator with Automated Sample Handling & Exposure System (ASHES) is a one-of-a-kind capability which can be used 24/7 with metal-halide lamps. 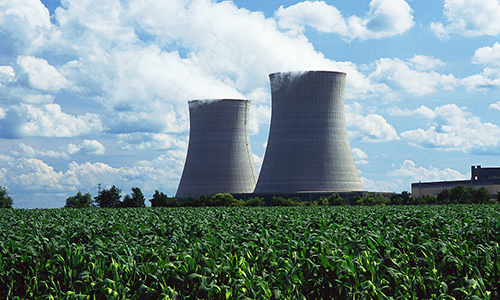 ASHES provides accelerated lifetime aging tests for materials under high-temperature/high-flux conditions. A robotic sample-handling system can be used to move multiple coupons automatically into and out of the concentrated flux sequentially to expose the samples to predetermined temperatures, fluxes, and/or durations. The peak irradiance is ~1.1 MW/m2 with an average irradiance of ~0.9 MW/m2 over a spot size of ~1 inch (2.5 cm). View a list of common frequently asked questions.